For a limited time, The Seven Deadly Wastes eBook is being offered free of charge on the Gradient Solutions website. 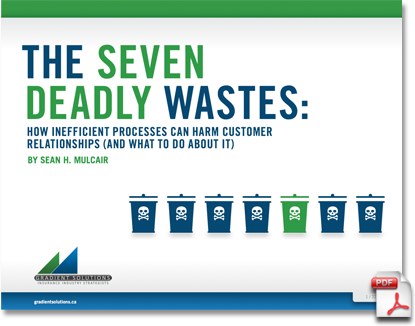 This popular eBook by Sean H. Mulcair will give you invaluable information on how to identify and combat waste within your operations. In addition, you will also receive the Seven Deadly Wastes Dashboard, a comprehensive tool that allows you to quickly identify the common causes of inefficiency that exist in your office, and the best approaches to resolve them. Please complete the form on the right to receive a copy of the eBook. By downloading this ebook, you agree to the terms. and LEAN INSURANCE™ will soon be available online! Obtain cost-effective online training and tools to improve your operational efficiency and increase your revenue! Work with consultants and have complete access to expertise and business tools 24/7 and at a speed that’s right for you!